Sunday 20th December 6pm Candlelit Carol Service. Thursday 24th December Christmas Eve 3pm Crib Service and Nativity for all the family, all children welcome to join in the play, costumes provided! 11:30pm Midnight Communion Service, experience the wonder as we celebrate the birth of Jesus. 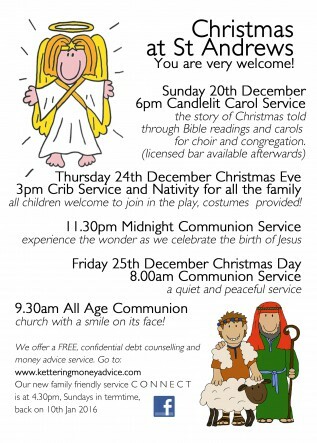 Friday 25th December Christmas Day 8am Communion Service, a quite and peaceful service. You may also buy or reserve tickets from Jaime Ferreira by email at office@ketteringartscentre.com or online at We Got Tickets (subject to a booking fee).